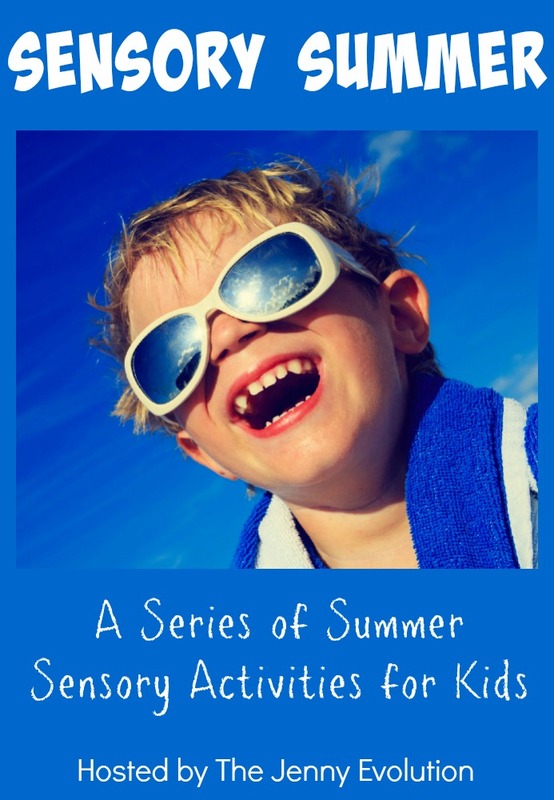 Looking for a fun tactile sensory activity for your kiddo this summer? 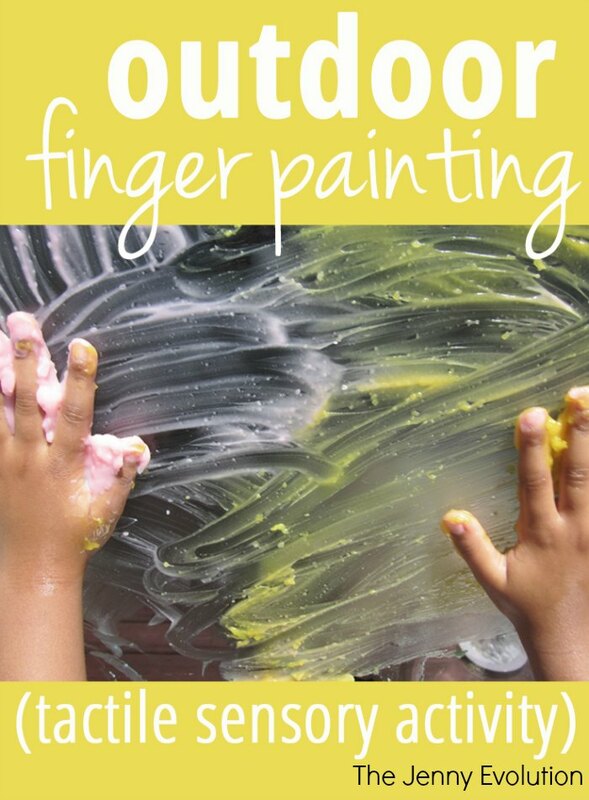 Outdoor finger painting is SO much more than just making a pretty picture. This activity is a full-on sensory experience that gets kids using their bodies, imagination and senses. 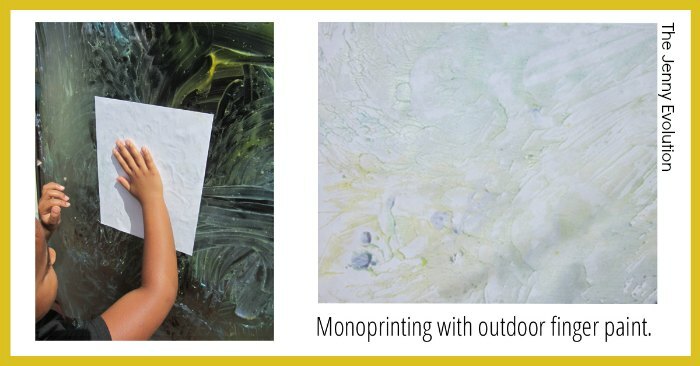 A fellow sensory mom at Sensory Mom Secrets is sharing her take on a full tactile experience with her inventive outdoor finger painting activity. In our sensory house we do a lot of tactile activities, which usually equals MESS! And although we do tactile activities frequently, I am just not a fan of the mess. 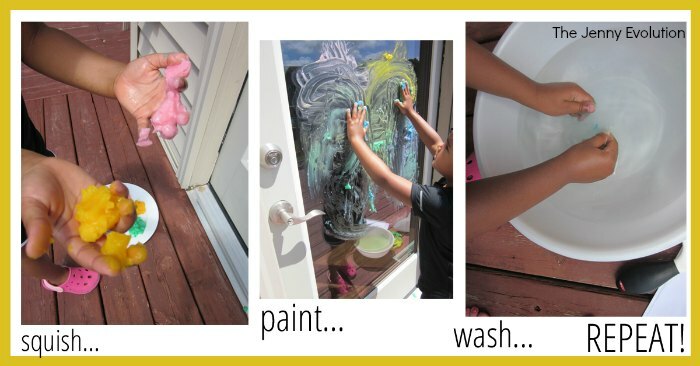 One of the great things about summer is taking the messy tactile activities outdoors. We made this awesome eco-friendly (also conveniently edible but doesn’t really taste good) finger paint. This summer I decided our patio door would make the perfect outdoor easel. You could also use windows, a glass outdoor table or pick up some plexiglass at a local hardware store. 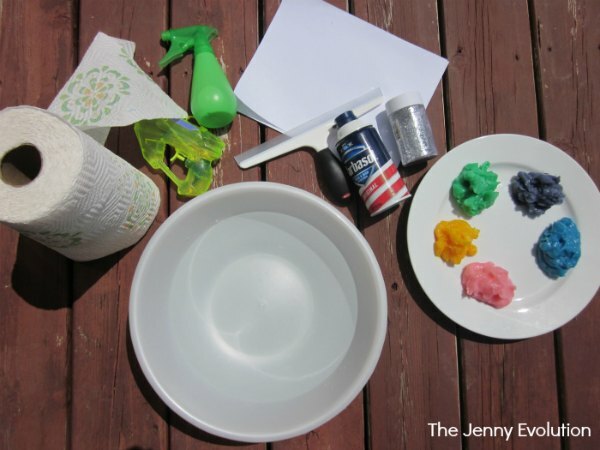 Supplies: finger paint, spray bottle, squirt guns, bowel of water, paper towels, paper, shaving cream with glitter, and shower squeegee or old credit card. Since Miss Sensory is both a seeker and sensitive any project we do I always provide her with water and towels to wash and dry her hands. It has taken her a long time in occupational therapy to even get her touch messy tactile activities. She does better when she knows she can wash it off right away. Miss Sensory started in on the paints. 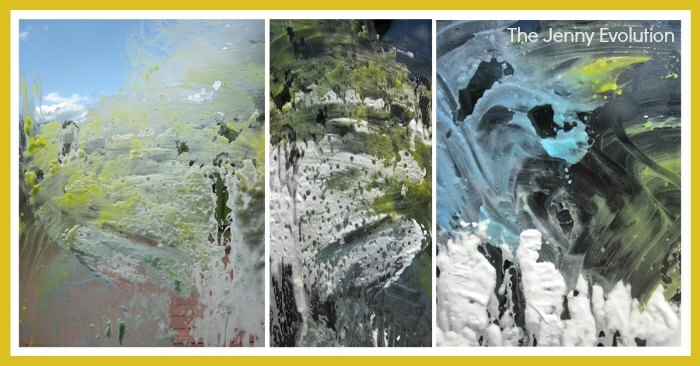 The recipe we made ended up to be part paint texture part slime texture, great for squeezing and squishing between fingers and smearing across the glass. Then I had her lay a piece of paper on top of the paint and press it down. We pulled the paper off to see a marbleized paint design. The thing about tactile play for Miss Sensory is that it is so calming for her. She spent a large amount of time rubbing the paint all over the glass. The final product turned out really cool with the mix of shaving cream and finger paint. But before this baked on our glass it was time for a few fun ways to clean-up. Cleaning up was probably just as fun as the tactile play. I brought out the spray bottle and squirt gun both great for strengthening those finger muscles. We also threw some water balloons at the door, used the squeegee and finally got the hose out to get everything washed off. Extra bonus for Mom’s and Dad’s to using your door or window: you get the window washed in all this fun! In the summer you can find Sensory Mom drinking lemonade and watching the sunset while attempting to keep up with Miss Sensory. Sensory Mom blogs at Sensory Mom Secrets on parenting a child with Sensory Processing Disorder sharing real life stories, the real mess of it all and finding real hope. « Number One Way to Connect as a Family? Dinner! This sounds like a lot of fun! Im trying to figure out where wd could do this. I have 1 daycare child I think may have some SPD the more I read the symptoms. She has gotten better about things but the vacuum is still bad. All we hear is ” turn it off” along w a lot of fussing. Connor (7) and I keep telling her that vacuuming is part of life & it has to be done. Connor just tells her “your just sensitive & thats OK”. Is it common for them also to have speech problems to? Ive been telling her to use big girl words,slow down when speaking and look at me when your talking – its helped some. My youngest one had speech problems… but it was definitely tied to his ongoing ear infections. This is great! 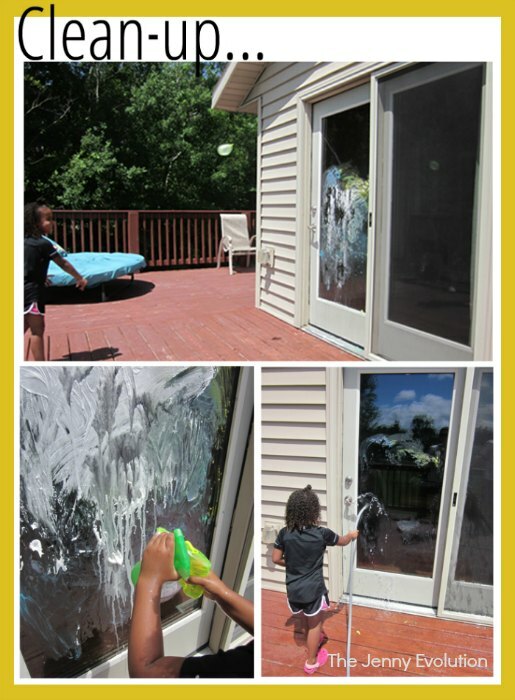 My little guy is going to love smearing all over the sliding glass doors! Thanks for the great idea!